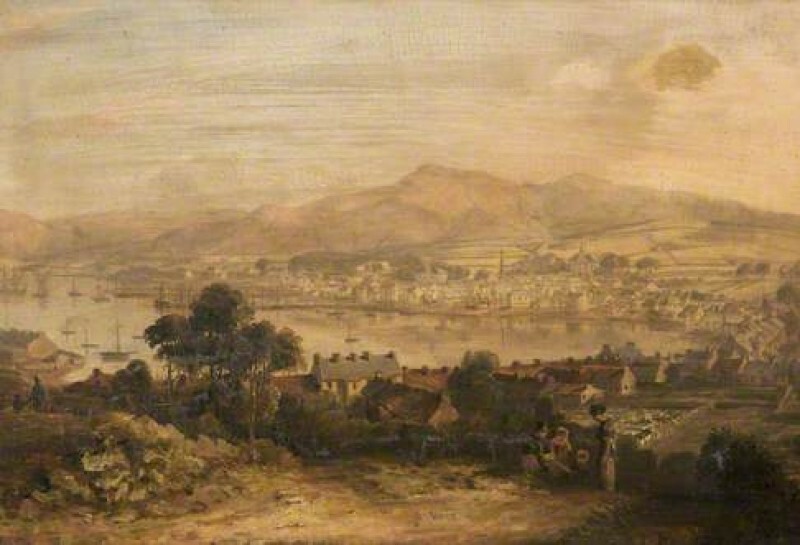 Bury Art Museum are in possession of a view of a Town and Bay by John B. Fleming, however the place depicted was not known. Martin Hopkinson thought it to possibly be Greenock, seen from the west: Fleming painted several paintings of the town from the east. Bury Art Museum revealed that the work has a framer’s label on the reverse that reads as follows; ‘From / Laurie & Fleming / Carvers, Gilders, Artists’ Colourmen / And Fine Art Dealers / 1 Bank Street, Greenock / Established 1816’: the coincidence was striking. The 'Scotland: Artists and Subjects' group were asked to take a look. However, Andrew Greg pointed out that Greenock is not in a tight bay like the one shown in the painting. Alan Crombie and Colin MacDonald concurred, having both worked and lived in the area, respectively. Colin thought the painting showed the neighbouring Gourock. Oliver Perry, however, found Swan's engraving after Fleming, which showed the scene is Campbeltown. A modern photo was found of the same spot, concluding the discussion, and the title was updated. Does John B. Fleming's 'Town and Bay' depict Greenock?